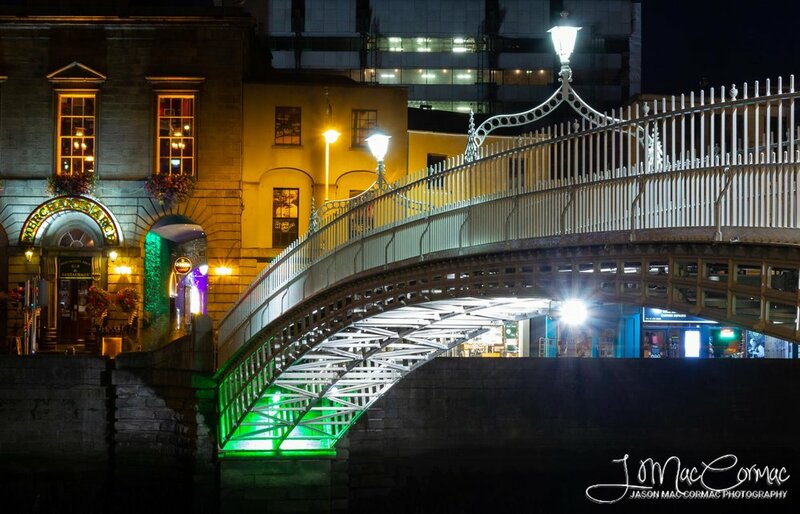 I took a spin into Dublin City Centre for some dusk and night time photography along the quays. Despite the overcast cloudy day a lovely sunset happened however I was not in the right place :( but I stood and admired it all the same. If I had been further up the quays perhaps I would have photographed the Samuel Beckett with the sunset behind, instead I was passing O'Connell Bridge and on towards the Ha'penny or Halfpenny Bridge. When I arrived at the Ha'penny the lights were still not lit and the sky was still quite bright. I started viewing through the lens looking for ideal compositions moving a few feet along the quay on left and right, and walking across the bridge a few times to view it from different angles, all before setting up my tripod. 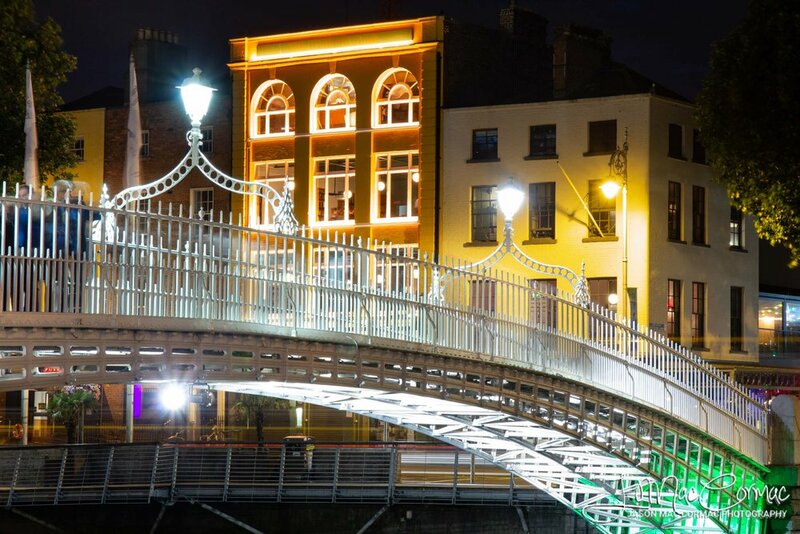 The bridge was busy with workers heading home, tourists heading out for dinner or drinks in Temple Bar, and a few worse for wear revellers even at this early hour. As dusk began to settle the sky started to turn deeper shade of blue. This is the perfect time for city images I think, I'm drawn to the lights and the blue at this hour moreso than an inky black dark sky. I set up my tripod and set to work to take some images, some wide angle of the full bridge and some with a longer focal length to hone in on a smaller section of the bridge and add prominence to the surrounding buildings. I did this on each side of the bridge and it wasn't long before darkness had completely fallen. I left the bridge and the city to the party goers confident I'd got some nice images. If you want more information on my adventures with my camera keep an eye out for new blog posts, or indeed give me a call or send an email. I'd be happy to answer any questions you may have. For now thanks for the interest, i'd appreciate a share or a like.